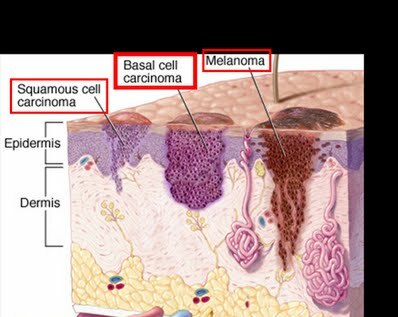 The most common cause of Basal Cell Carcinoma (BCC) is too much exposure to ultraviolet (UV) light from the sun or tanning beds. While BCC can occur anywhere on your body, the most common areas are those exposed to the sun, such as: your face, head, neck, and ears. It is also possible for a basal cell carcinoma to develop where burns, scars, or ulcers have damaged the skin. Basal cell carcinomas are not contagious. Who is most likely to have a BCC? What are basal cell carcinomas like? Most basal cell carcinomas are painless. Some basal cell carcinomas are very superficial and look like a scaly red flat mark, others show a white pearly rim surrounding a central crater. People often become first aware of them as a scab that bleeds occasionally and does not heal completely. If left for years, the latter type can gnaw away at the skin, eventually causing an ulcer. Other basal cell carcinomas are quite lumpy, with one or more shiny nodules often containing easily seen blood vessels. To confirm the diagnosis, a small section of the abnormal area or the whole area may be cut out and examined under the microscope. You will be given a local anesthetic before to numb the skin. Yes, basal cell carcinomas can be cured in almost every case, although treatment becomes complicated if they have been left for a very long time or if they are in an awkward place – such as near the eye, nose, or ear. Rarely they can spread to other parts of the body. The most common treatment for basal cell carcinoma is surgery. First, a biopsy of the lesion is performed. If the BCC is confirmed, the spot itself is removed, along with some clear skin around it, using local anesthetic to numb the skin. Often, a small skin graft or skin flap is utilized. The most common approach to removing a basal cell carcinoma at Conestoga Eye is through Mohs micrographic surgery. Mohs surgery is a precise surgical technique used to treat skin cancer. During Mohs surgery, thin layers of cancer-containing skin are progressively removed and examined until only cancer-free tissue remains. Mohs surgery is also known as Mohs micrographic surgery. The goal of Mohs surgery is to remove as much of the skin cancer as possible, while doing minimal damage to surrounding healthy tissue. Mohs surgery is usually done on an outpatient basis using a local anesthetic. Dr. Silbert will refer you to a specialized dermatologist who will perform the surgery, the day before you are scheduled for reconstruction with Dr. Silbert. Mohs surgery is an improvement to standard surgery (local excision), which involves removing the visible cancer and a small margin of surrounding healthy tissue all at once. Mohs surgery allows surgeons to verify that all cancer cells have been removed at the time of surgery. This increases the chance of a cure and reduces the need for additional treatments or additional surgery. Dr. Silbert refers patients to Dr. Hebel, or Dr. McGillis in Lancaster for MOHS surgery. Cover up! Protect the skin with clothing, including a hat, T-shirt and UV protective sunglasses. Our office stocks polarized sunglasses designed to block the harmful rays of the sun. Avoid strong sunlight. Spend time in the shade when it s sunny particularly between 11 am and 3 pm. Use a high protection sunscreen of at least SPF30 which also has high UVA protection and make sure you apply it generously and frequently when in the sun, preferably every 2-3 hours. Sunscreens should not be used as an alternative to clothing or shade, rather they offer additional protection. No sunscreen will provide 100% protection. Do not ever use sun/tanning beds. Check your skin for changes once a month. A friend or family member can help you with this particularly with checking your back. If anything on your skin is changing, or if you are suspicious or worried about anything, go to your doctor and have it looked at. What can I do to prevent BCC? The most important thing you can do after your surgery to care for your eyes is wear high quality sunglasses! Not all sunglasses are the same. If you have questions as to whether your sunglasses have sufficient protection, see Michele in our optical shop.